As an adoptee who has long supported mothers of adoption loss (and fathers, too, since it was my father who relinquished me to adoption), I am in support of SilverDove’s post http://familypreservation.blogspot.com/2009/06/royal-brisbane-apology.html that gives a brief background of the public apology from The Royal Brisbane and Women’s Hospital in Queensland, Australia for the inhumane treatment of mothers who lost their babies at birth to adoption. Readers’ comments at Silverdove’s post are very insightful. She includes links to other sites for Australian mothers of adoption loss — a must read for adoption awareness. This letter of apology from an Australian hospital that took newborn infants away from their mothers at birth solely because the babies were illegitimate and their mothers labeled as unfit, sets a new, and hopefully, growing precedent of the acknowledgment of pain and suffering inflicted on teens and young women who have been, and are, victims of the vast, worldwide multi-billion dollar adoption industry. Single women of any age do not deserve for others to take their newborns away from them at birth, or soon afterward. Their infants are also victims. This letter is an example to the rest of the world. Respect mothers. Respect their newborn children. Stop adoption abuse. Find ways to support a single mother to keep her child because a pregnant woman and her baby are a family. Birth is how we all came to be. If you were taken from your mother, or you lost your baby at birth – you would not like it, either. SUPPORT FAMILY PRESERVATION. End the widespread practice of the kidnapping of newborns from their mothers — now. 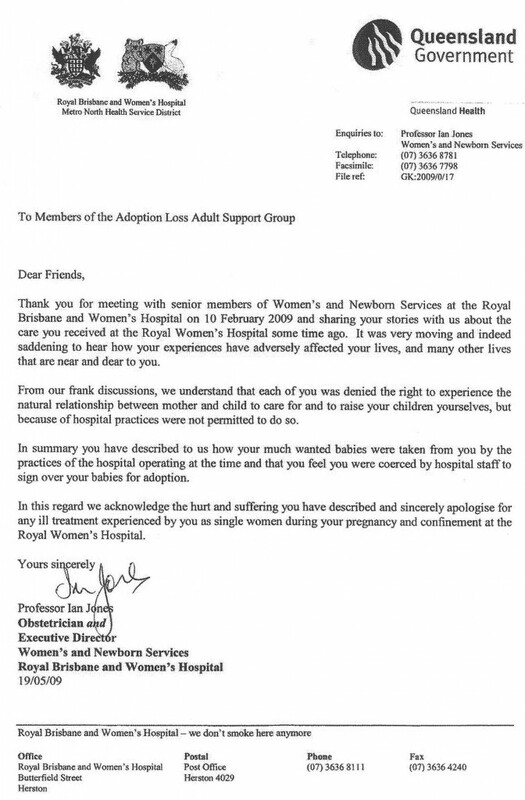 MOTHERS OF ADOPTION LOSS: Send a copy of this letter from Brisbane Hospital to all adoption agencies and maternity wards of hospitals all over America. With it, send your own letter explaining why you want an apology from the hospital and maternity “Home” that took your child. ADOPTEES: Send a copy of this letter from Brisbane Hospital and write your own letter to the hospital you were born in (if you know the name of it) explaining that you do not appreciate being stolen from your mother at birth. That act prevented you from being loved and cared for by your mother, prevented you from the natural emotional closeness the two of you shared. The act of taking you away at birth prevented you from drinking nourishing milk from your mother’s breast; the act of suckling not only strengthens the symbiotic bond between a mother and her child, but it provides the baby with natural biological proteins and immune system building blocks needed for life outside the mother’s womb. Adoptees: the act of ripping you from your mother is an act of violence against both of you and your mother. The natural order of life itself was disrupted. Tell the hospital you resent what was done to you. SOCIAL WORKERS: Stop separating mothers and their newborns. You are creating lifelong pain and suffering. PREGNANT AND SCARED: Do not feel that you must give up your baby to a couple who wants your baby. YOU are your child’s mother. Keep your baby!